Perfection is a lofty standard. Many have tried and failed. They have failed for a number of reasons but most of all — for being human. Humans are fallible. What differentiates humans from all other mammals is the ability to THINK. With thinking comes error. Expecting a person to be absolutely correct 100% of the time is unreasonable. A probationary police officer (PPO) in training with his field training officer (FTO) is fired for a mistake in judgment and violations of policy and procedures. In his second day of training the officer used deadly force in response to a subject who had driven a vehicle through a window of a car dealership and then attacked the officer. In the current fish bowl environment of law enforcement, the decision to fire the PPO was fairly easy. But at what cost? The city is out $30-40K in training cost, salary, and equipment. There will be a lawsuit with a quick settlement. The Chief can wipe his hands clean and say the incident is over and has been dealt with. Or has it? For all the posturing to look good, it doesn’t address how the PPO was trained in decision-making. Or the not-so-subtle message reverberating throughout the organization about the rejection of mistakes! For many months now, I have been designing a completely new police field training model for training new recruits. It’s called The Adaptive FTO™. This program accounts for properly addressing mistakes, errors, and failures. Molded from the John Maxwell book Failing Forward, this new FTO training model addresses how screw-ups and errors in judgment are remediated. Early in life, small children find their way through trial-and-error. Look at the toys small toddlers play with. One comes to mind is the Shapes Box. The object of the game is place the correct shaped block in the box through a correspondingly shaped hole. Through multiple attempts (and failures) the toddler eventually manages to get all the blocks inside the box — through the correct holes. Praise is given with each correct match-up of blocks through the holes. As the child become more proficient and adept at identifying shapes, each attempt to “win” takes less time. As a learning tool, this game is great for early child developmental learning. The game teaches shape identification, color identification, and more importantly… success through trial-and-error. Fast forward to the probationary police officer. The current crop of PPOs are from the millennial generation — the babies of “helicopter” parents and products of everyone-gets-a-trophy mindset. These Millennials were taught to ask “Why” and to spread their little creative wings and…try. The word “try” is important in understanding the new PPO. Encouraged from an early age to try and try again, failure is a pathway to success. For the FTO, understanding this concept is as important as providing proper feedback. Mistakes are part of life. Deal with it and move forward. That is how courageous FTOs should view errors. But sadly, more often than not, mistakes are viewed as the worst thing a PPO can make. This leads to mental paralysis, failure to make a decision, over-analysis, delay, second-guessing, and the death of creativity. Creativity is the lifeblood of our professional. Stifling creativity sustains the “that’s the way we’ve always done it” attitude. For the FTO, the concept of failing forward is an important teaching and developmental tool. Mistakes are not failure; they are an opportunity for growth! Incidents that cause serious embarrassment to the department. PPOs are going to make mistakes. 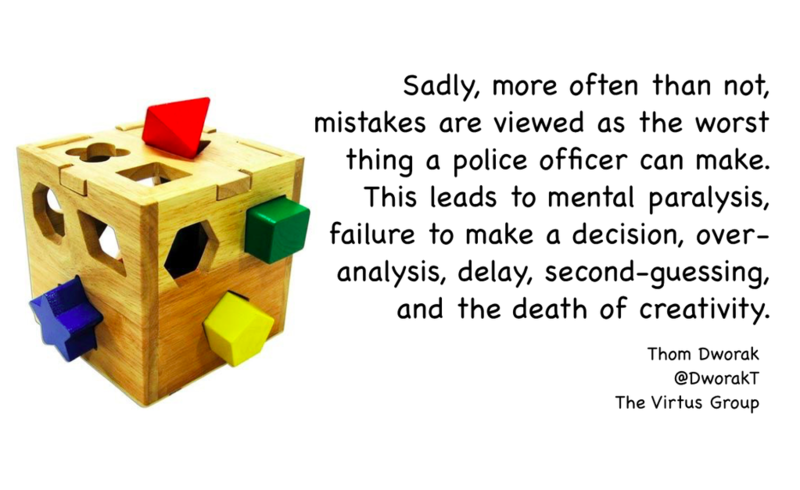 It’s the FTO’s responsibility to reduce the impact of those mistakes. The FTO must apply feedback, remediation, and review of the PPO’s critical thinking/decision making skills. PPOs need to play with the proverbial Shapes Box. And FTOs need to become more comfortable with cleaning off the slobber before putting the toys away for the night. Thomas Dworak is a consultant/trainer for The Virtus Group, Inc., a firm devoted to developing public safety leadership. Thom can be reached on Twitter @dworakt. Be sure to follow these ideas at @TheVirtusGroup.